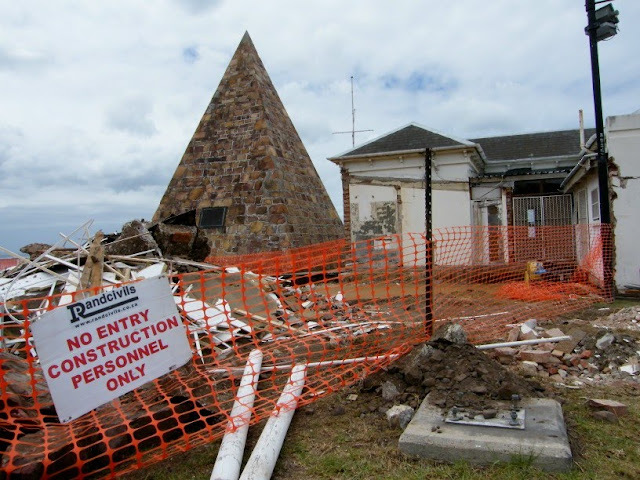 The Nelson Mandela Bay Municipality, through the Mandela Bay Development Agency (MBDA) is busy with a upgrade of the Donkin Reserve and the historic buildings on it. 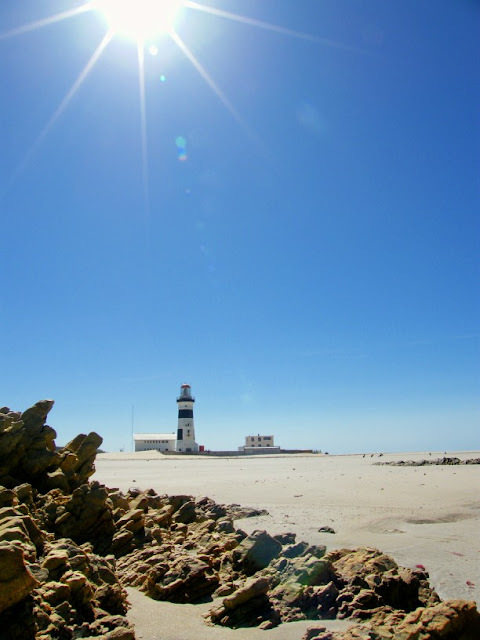 Part of the project is the restoration and upgrading of the lighthouse and the old lighthouse keeper's building which acts as a tourist information office managed by Nelson Mandela Bay Tourism. 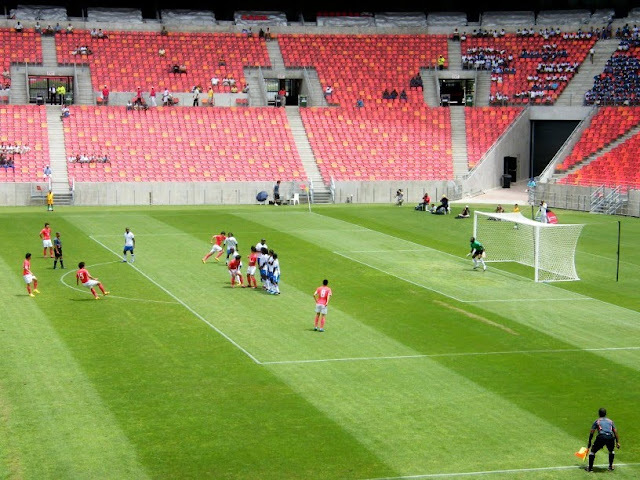 Work started on the project last week and is expected to be finished before the start of the 2010 FIFA World Cup in June. When work is done the building will, in addition to the tourist info office, also contain a small coffee and curio shop. To get to the top of the Campanile you have to climb 204 steps which, obviously, you also need to take to get back to the bottom. If you don't take it easy going up, its needless to say that you will be out of breath. But going down at a fast rate will leave you dizzy in the head. 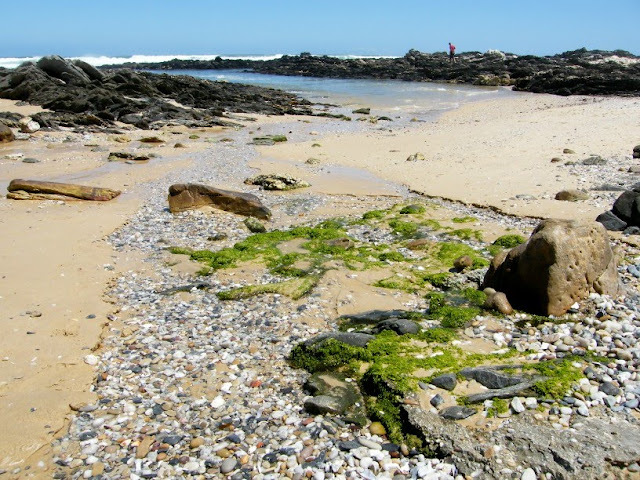 Happy Valley just off Humewood Beach is a wonderland of note for any child and on of Port Elizabeth's oldest (oldest not as in historic but as in something that has been there like forever) attractions. 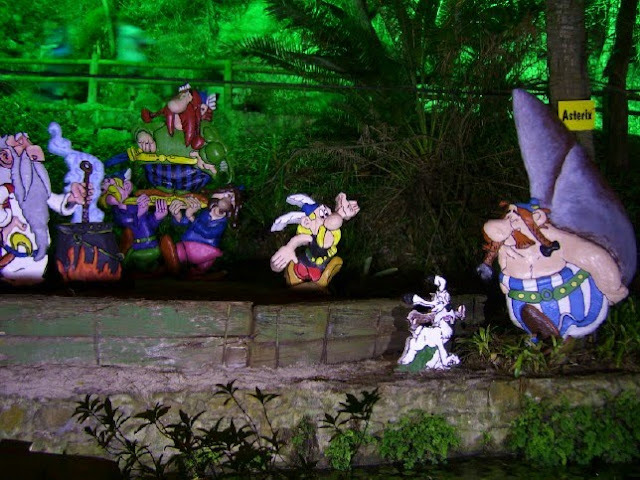 In summer the valley is lit up with colourful lights while all along the pathway visitors will find all kinds of children story and rhyme characters. Happy Vally is an institution with parents taking their kids to a place where they have gone as kids themselves. 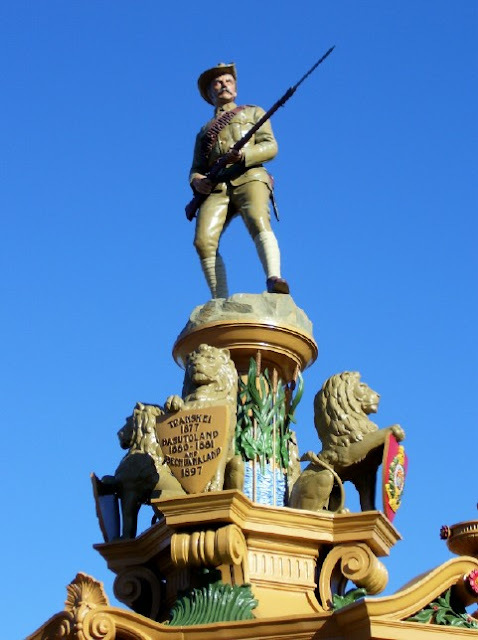 The Prince Alfred's Guard Memorial is situated on top of Port Elizabeth's second oldest water reservoir in St Georges Park and was unveiled in 1907. This memorial forms the central ornamental feature of the Service Reservoir. On the top of the central pedestal is a life-size figure of a sergeant-major of Prince Alfred's Guard, in full dress and standing at the "charge" and immediately below him are four lions, each holding a shield. 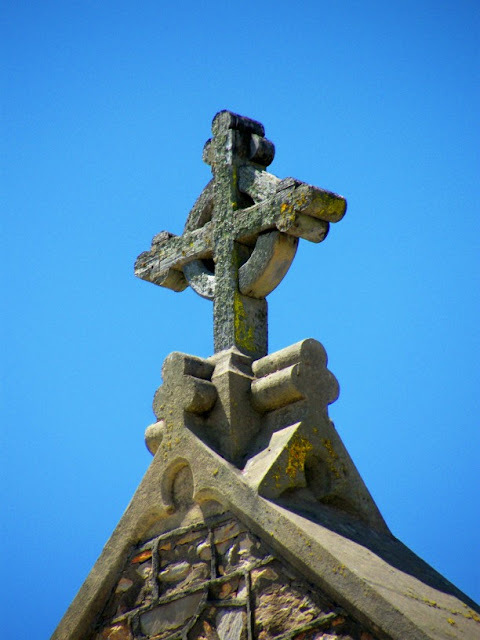 The memorial is in remembrance to men from the guard that dies in theTranskei War, 1877 ; Basutoland War, 1880-1881; Bechuanaland War, 1897; and the Anglo Boer War 1899 - 1902. 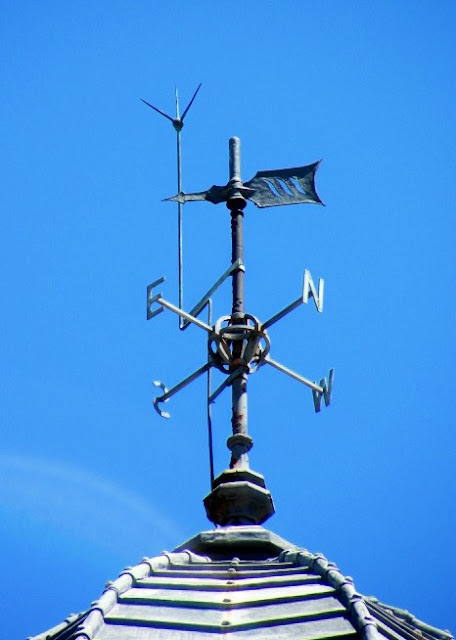 For more awesome pictures of the sky and above, visit Skywatch. 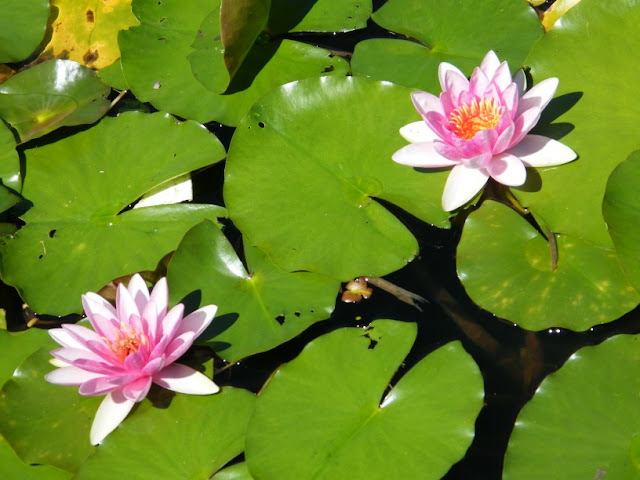 There are a lot of fresh water springs that originate along the Wildside coast of Port Elizabeth. 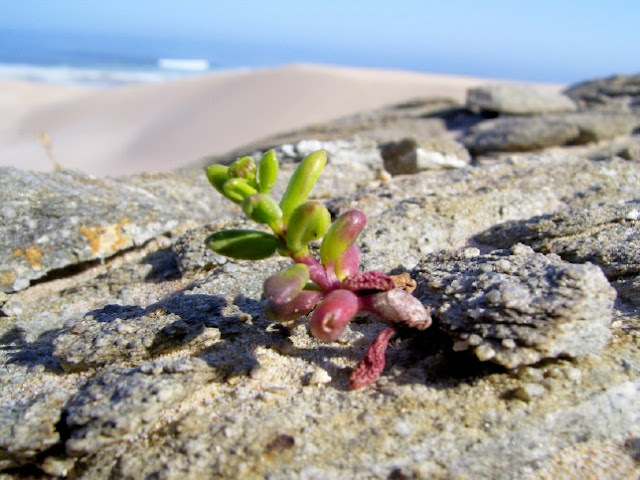 All along the coast at places like Willows, Schoenmakerskop, Kini Bay and Seaview and in between you would find fresh water seeping through the rocks and running down to the sea. Its normally easy to spot these little streams as you would find reeds growing next to them or the pools they collect in. Also where they run down past the rocks green algae grow on the rocks. Another example taken and explained by Luc Hosten on the Friends of Schoenmakerskop page on Facebook. 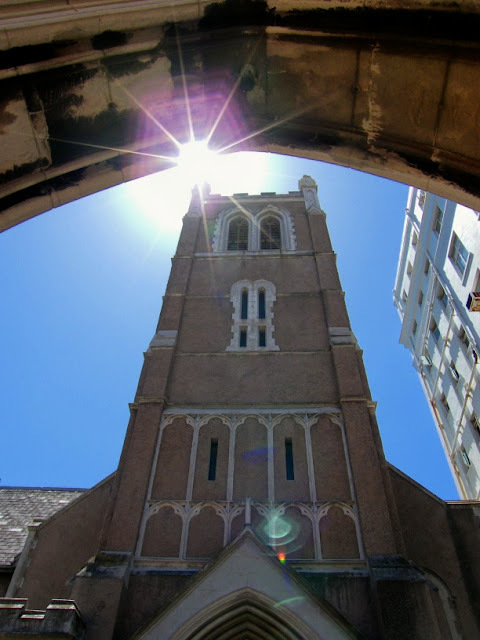 The sun shining through the arched gate in front of St Mary's Anglican Cathedral in the city centre. 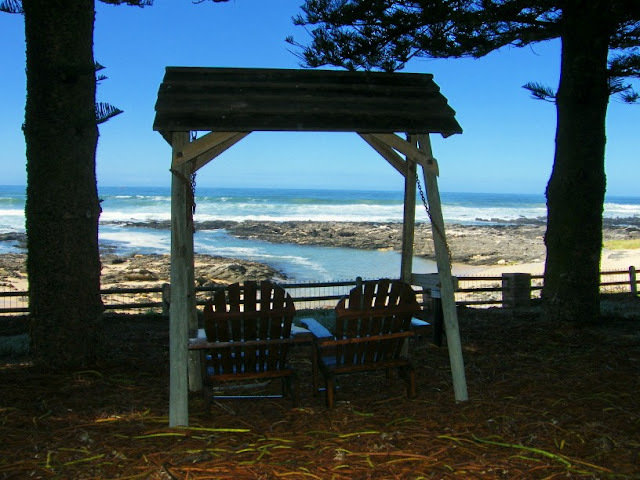 Kini Bay is situated west of Port Elizabeth and is part of Port Elizabeth's "Wildside". 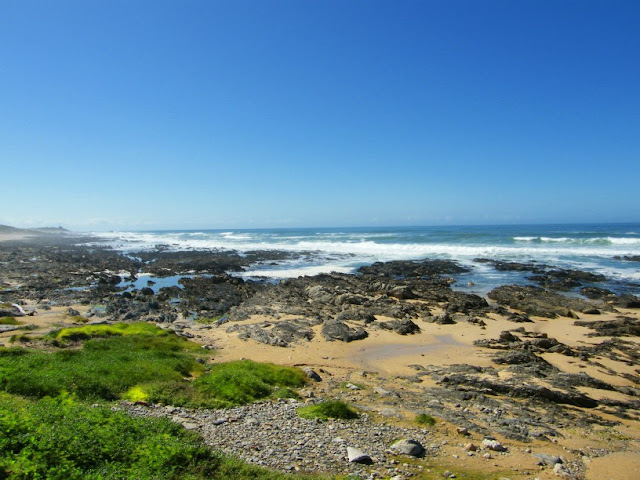 The Wildside refers to the coastline outside Algoa Bay stretching to the west. Most of it consist of rocky shoreline although there are sections of magnificent sandy beaches in between at Sardinia Bay and Maitlands. Kini Bay is a small "village" (actually a suburb of Port Elizabeth) just before you get to Seaview. It is said that the name originates from the fact that in the mid(ish) 20th century a lot of young ladies who went to the beach there wore bikinis and that it was referred to as the bikini beach. This has evolved to Kini Bay. Maybe the reason for the shorter (smaller) version of the name has something to do with the fact that bikinis are so much smaller today than they were in those days. 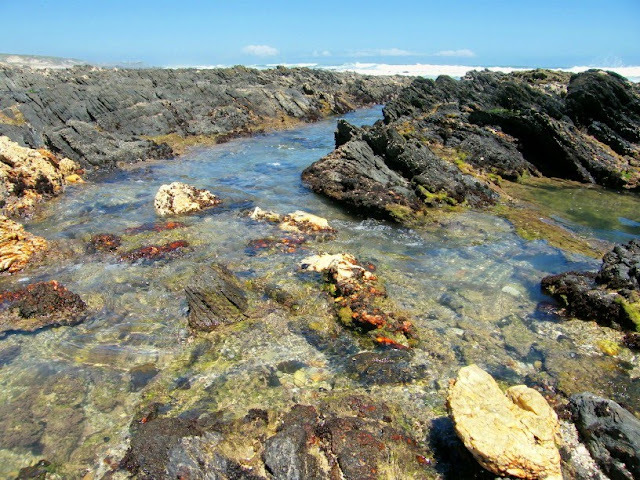 Rock pools at Kini Bay just west of Port Elizabeth. The turnoff to the little village is just before Seaview, but most people don't really know that it is there which means that it's a nice and quiet spot. I got to visit the Sea Otters Lodge in Kini Bay just west of Port Elizabeth today and was stunned by its perfect setting. Walking out onto the back garden you are literally on the beach. At the bottom of the garden is a two seater swing with the perfect view. I could see myself spending a day sitting there with a drink, a book and lots of peace and quiet. There is quite a number of interesting and historic buildings in the area around Market Square in the city centre. One of those which is just across the road from the City Hall is Pleinhuis. The building belongs to the municipality and houses amongst others the offices of the portfolio councillors on the mayoral committee. 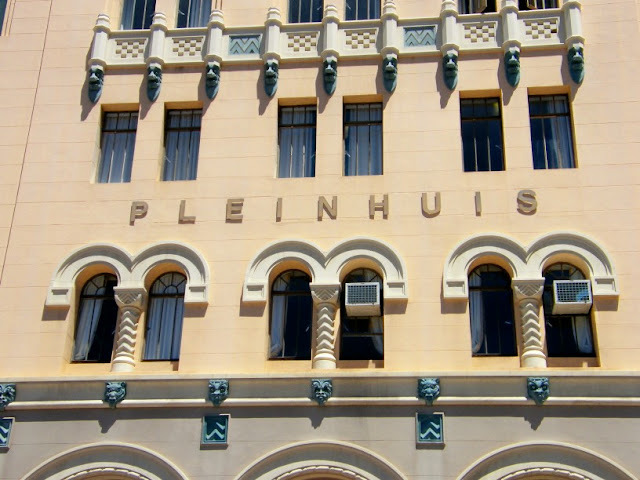 Like so many other buildings built in Port Elizabeth at that time, Pleinhuis was built in the Art Deco style. When I passed it the other day I noticed that, like so many places these days, it had its name changed. The new name is Noninzi Luzipho Building. I still think Pleinhuis is a suitable name as its on the plein (square as in Market Square). 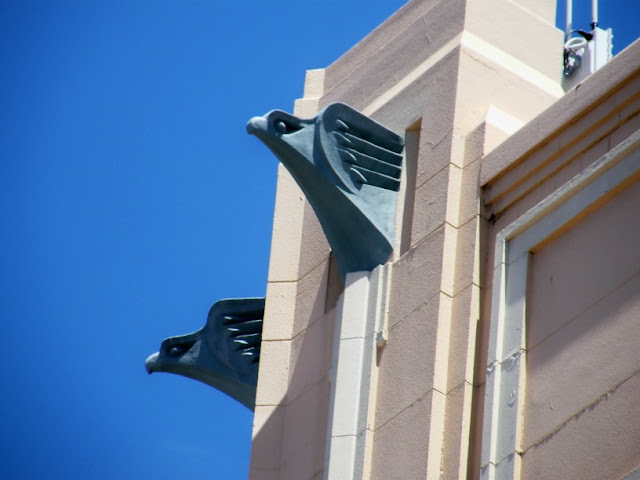 The Gargoyle birds from the other day's post is on top of Pleinhuis. Taking a walk around the city centre the other day, I noticed this feature on the side of the Main Library building facing St Mary's Church. 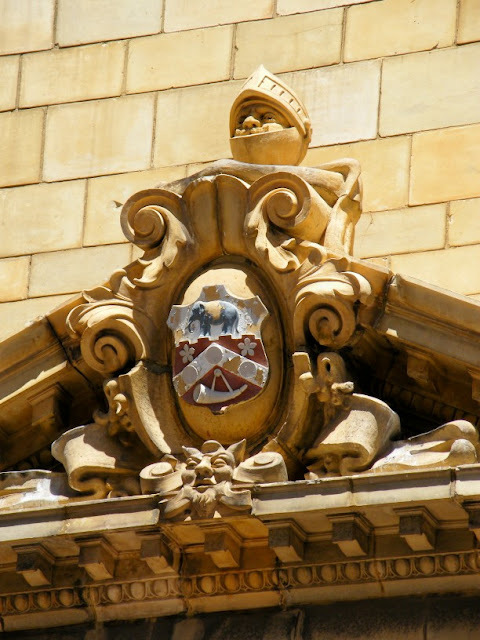 The emblem in the middle is Port Elizabeth's old coat of arms, but I found the knight at the top to be quite a peculiar site. Oh and, is that a gargoyle I see at the bottom? Not many of them around town. On the top of Plein Huis across the road from Market Square there is a number ornamental birds. They actually look like they should rather be Gargoyles than birds, but what do I know about those ugly fellas that usually sit on top of buildings scanning the ground? My theory for these birds are that they were put there to stop actual birds from sitting on the top of the building messing on the walls and possible the heads of people walking past. I had to pop down into the city centre this week and found this tree in front of the City Hall with all its bright red fruit, flowers, fruity flowers (sorry, but I don't really know if they were the tree's fruit or flowers). 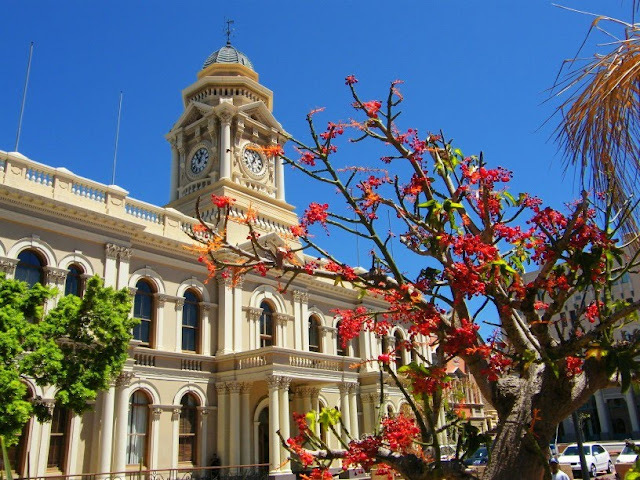 As I was walking past it and I found a very nice angle to include it in a picture of the historic City Hall. Never leave home without your camera. 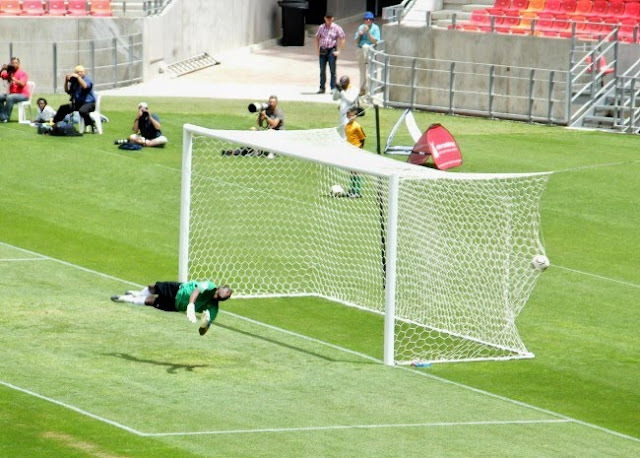 As everybody should know by now, South Africa will be hosting the 2010 FIFA World Cup in June and July this year. 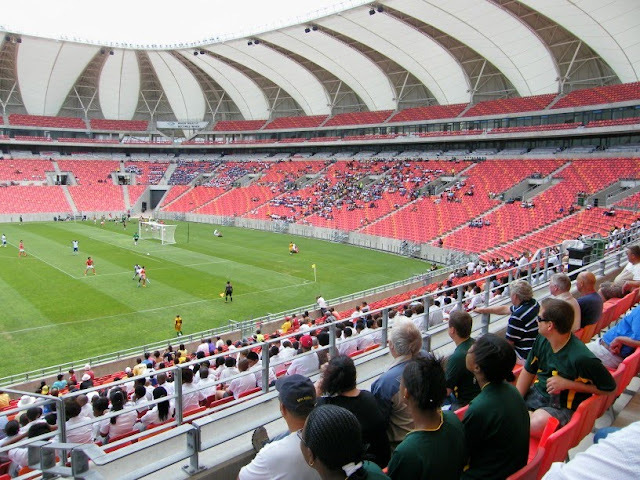 Port Elizabeth is one of the proud host cities and matches will be played in the new Nelson Mandela Bay Stadium. The final draw for the tournament was done early in December and we found out that Germany, England and Portugal will all be playing in PE in the first round. Another one of the teams that will be in PE for a first round match is Korea Republic. They are in South Africa for a training camp at the moment and is playing a match in each of the stadiums they will be playing in during their first round matches. We were fortunate that they decided to play a game in PE against out First Division team Bay United. Unfortunately Umlilo was outplayed 3 goals to 1, but our locals boys didn't do badly at all for a first division team playing a national team that has qualified for the World Cup. Moments later Korea attacked again and scored a magnificent goal. Just at that moment I was focused on the goalie and was very lucky to get this awesome shot with the goalie in mid air and the ball in the back of the net. Fort Frederick was built by the British in 1799 to protect Algoa Bay from possible French invasion. Ironically the fort never got to fire a shot in anger in all the time it was in commission. We popped into the Schoenmakerskop Flea Market this morning for a quick squize. Its not one of those big markets but something a little bit more intimate. 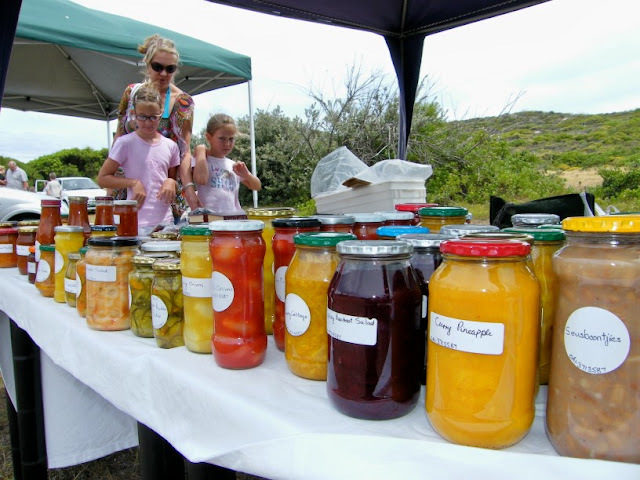 This one particular stall had a huge range of jams, preserves and pickled items at the most unbelievable prices. Usually you would pay about R20 or R25 for a bottle of jam. This guy was selling them for about R12 (not even $2 US) each. Needles to say, my mom who was visiting for the weekend took about 8 different jams while the Damselfly also took a couple. Next month we'll pop in again to restock the supply. This is the last of my short series of pics of Kragga Kamma Game Park and some of its animals. 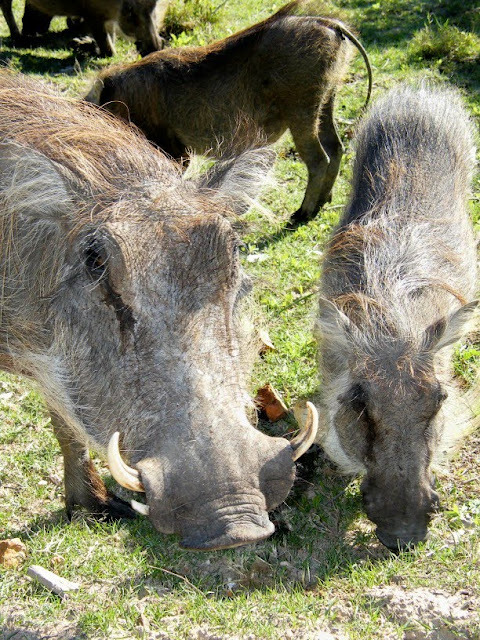 I love seeing warthog (love eating them as well, but that's for another post), specially when they stick their tails in the air and run off. The other thing that fascinates me is how they stand on their front knees when eating. Does it mean they are religious animals? 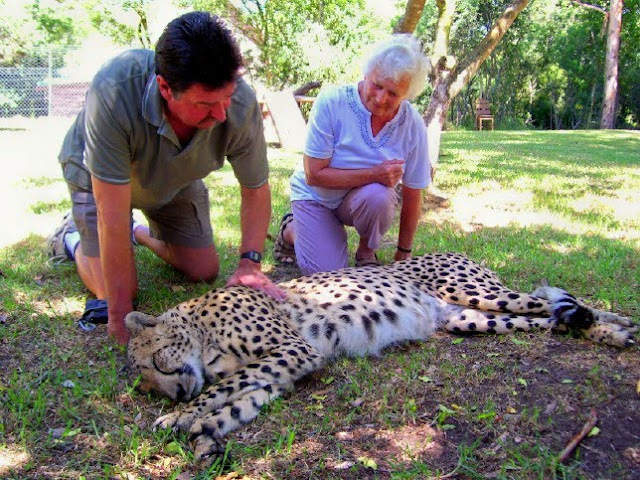 One of the highlights for visitors to Kragga Kamma Game Park is the opportunity to handle Dume, the tame cheetah. Duma is actually a movie star and was one of the cubs that was used in the making of the film with the same name. According to those in the know, cheetahs are the only of the big cats that can be tamed 100%. But you still need to be careful when playing with him. Don't tickle his tummy and don't touch his face. Imagine you tickling a cat's tummy. He will roll onto his back and playfully grab your arm with his claws. Now imagine a cheetah doing it. So, keeping in mind the rules, visitors get to go into Duma's enclosure and pose for a photo or two. He is a bit of a temperamental cat (but isn't all movie stars), so you may have walk over to him and wait for him to decide when he is ready for a pose. Once you have completed the first part of your drive through Kragga Kamma Game Park, visitors can go for a snack and a drink at the restaurant. 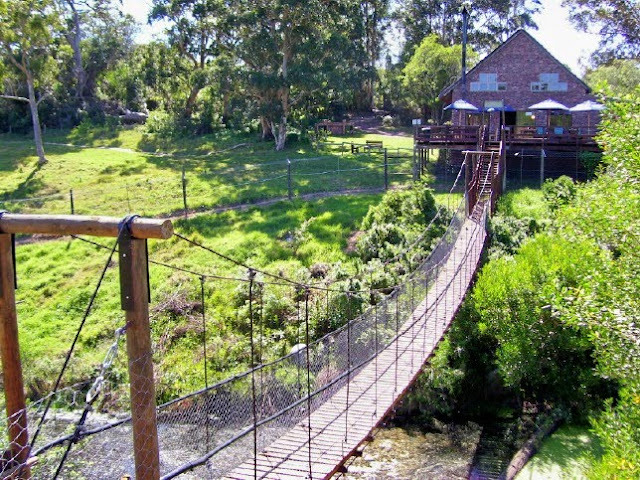 The restaurant overlooks a big waterhole and over it is a suspension bridge leading to their Monkey Walk. The monkey walk is a raised walkway on which visitors often spot vervet monkeys. I love donkeys in pajamas, aka, Zebra. The common zebra around this part of the country is the Burchell's Zebra. The way to identify a Burchell's Zebra is by looking at the striped. Their stripes extend under their bellies while the stripes on their lower legs are faint. They also have a phantom brown stripe on their white stripes. This pic was also taken at Kragga Kamma Game Park in Port Elizabeth. I decided to do a bit of a series on Kragga Kamma Game Park. Two reasons really. Firstly Kragga Kamma is one of my favorite attractions in Port Elizabeth and secondly I have kinda ran out of new PE material for now. But I will get out there asap to take some more. 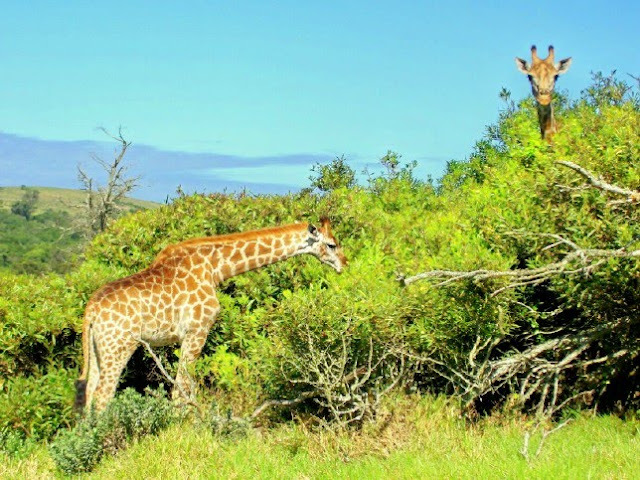 So to start out here is a picture of two giraffe at Kragga Kamma Game Park. One of the new features at the Boardwalk complex this summer are the floating balls. 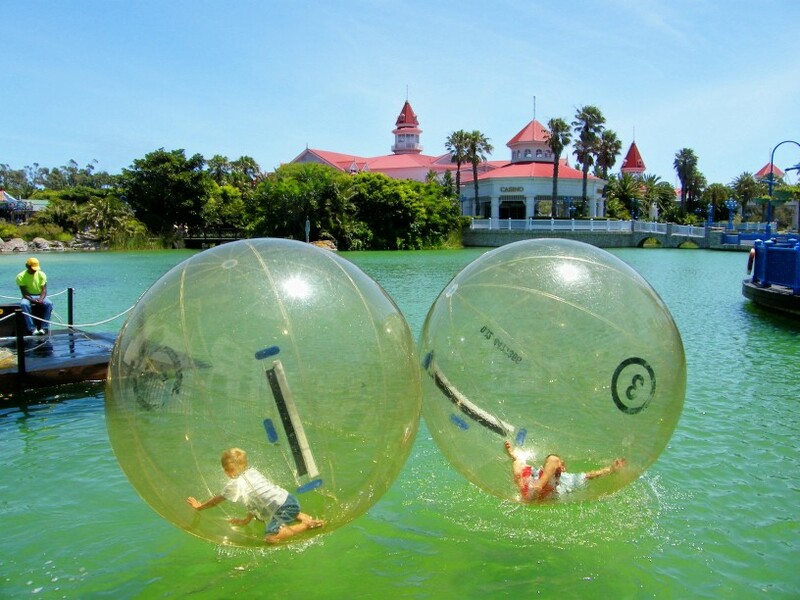 You get into the deflated ball which gets inflated and velcro'd closed before being pushed onto the lake. It doesn't look like the easiest thing judging on the fact that the kids doing it were more flat on their backs than on their feet. It did look like lots of fun though. This is the view from the top of the Campanile out of the window facing north. The three lane freeway is the Settlers Freeway which connects the beachfront area to most of the city as well as the N2 highway out of town. 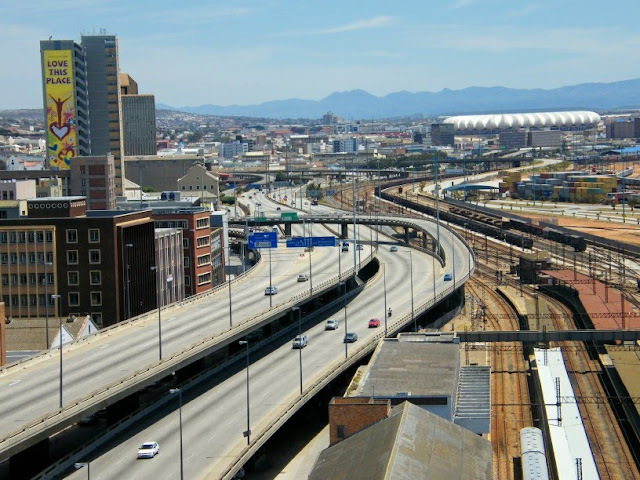 The buildings on the left is part of the city centre while the bottom right of the picture is the Port Elizabeth Station. In the back the Nelson Mandela Bay Stadium is visible with the mountains beyond Uitenhage in the background. I would like to wish all the Port Elizabeth Daily Photo readers a Happy New Year. May the year ahead bring you nothing but joy and happiness. And stick with us, because 2010 is going to be a very exciting year here in Port Elizabeth what with the 2010 FIFA World Cup and everything else happening in our fair city. Here's to 2010. Cheers! The photo was taken at the annual Opening of the Season that normally takes place on 16 December at Hobie Beach.